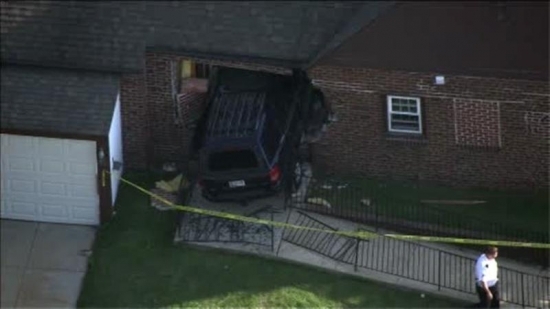 Two people were injured after a SUV slammed through the front door of a brick home in Philadelphia's Rhawnhurt section. It happened around 5:35 p.m. this afternoon at the intersection of Castor Avenue and Loney Street. When police arrived they found a Jeep Cherokee crashed into the front of the building. Two people were taken to Frankford campus of Aria Health for treatment, including a juvenile. It is unclear if they were inside the car or house. The investigation is still trying to determine what caused the Jeep to leave the road. L&I will take a look at the building to see if it is still structurally sound. Multiple people were wounded by shotgun fire in Philadelphia for the second time in three days this afternoon. It happened around 2:30 p.m. on the 700 block of East Hilton Street in Kensington. Seven people were injured by the shooting. Three adults were taken to Temple University Hospital in the back of police cruisers. Two were in critical condition, one was in stable condition. An 11-year-old girl, 3-year-old girl, and 10-year-old boy were among the injured. A shotgun was found a the scene. The shooter fled on foot. He is described as a stocky black male, 25-30, 5' 7”, wearing a black neckerchief, and red and white tank top. Police do not yet know what prompted the shooting. On Saturday, 10 people were injured during a shotgun shooting at a block party in West Philadelphia, three were children. Two suspects are still being sought. "Out of an abundance of caution and in the interests of maintaining the highest possible standards for product quality, Niagara is issuing a voluntary recall for all spring water products produced from its Pennsylvania manufacturing facilities during the June 10th - June 18th time frame. Niagara was notified that the source was potentially compromised. There have been no reports of any illness or injury related to the above mentioned products to date and finished product testing detected no contaminants or issues of any kind. This voluntary withdrawal is being implemented in cooperation with State and Federal Agencies." Mostly clear and warm, temperatures in the 80's this evening in Center City.